Insurtech neologism identifies almost any technology-driven innovation in the insurance industry: software, applications, startups, products, services. Borrowed by the term “fintech” related to the banking sector, insurtech is also considered a product of this sector and is therefore very similar, both in terms of the impact on traditional companies in the sector, and in terms of its basis and the speed of its growth. The term comes from the combination of the words insurance and technology since it is actually the match and synergy between these two fields, insurance and digital technologies. Like banks, insurance companies were among the slowest industries to adapt to digitalization and to seize the opportunities offered by this changing process. While in the age of internet 1.0 the digitalization of companies (very challenging in Italy) was perceived as the mere opening of a corporate website, intended as an online transposition of the paper brochure, and in the age of internet 2.0 as an entry into the social or e-commerce system, now, in the age of industry 4.0, digital technology has impacted the insurance industry as a hurricane, enforcing the revolution. Digitalization has never only been “being on the Internet” or “being on social networks”, but rather a new approach to business models, new processes, new data management and a new approach to customer contact. CBInsights, a consulting and reporting firm following the insurtech for a long time, goes back to 2011 in identifying the first investments in the sector, and in 2015, as shown in the chart, the real boom takes place internationally (albeit with a strong presence in the U.S.). 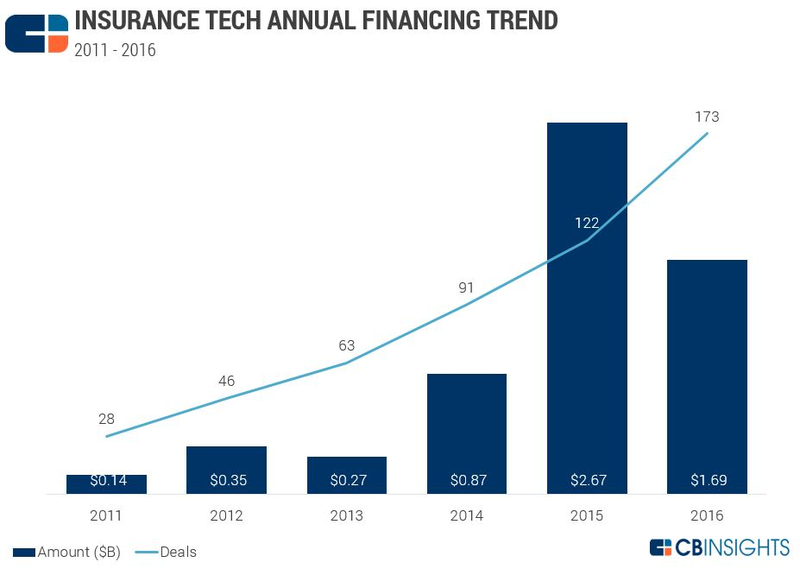 In addition to the number and size of investments, what has characterized the last two years for insurtech has also been the fact that, in different ways, traditional companies have finally “embraced” this area, starting to focus on and collaborate with insurtech startups, often funding or acquiring them with their own venture capital funds. Corporate innovation labs, acceleration programs, incubators, dedicated events have risen (see here those not to be missed in 2017). What are insurtech technologies and topics leading the industry? According to Enrico Aprico, Adjunct Professor at Università Cattolica del Sacro Cuore, sharing economy and marketing specialist, a key topic for the insurtech sector is sharing economy. The whole value chain of companies is endangered by new business models linked to the sharing economy and digitalization. Products, marketing, distribution, prices have been evolving. Lemonade, a very aggressive New York insurtech startup, is an iconic case, whose vision consisted of rethinking not only insurance products, but even any part of the value chain, to create an increasingly responsive offer, tailored to the real needs of customers, perfectly placed within the contemporary age. The result is a technology-first and legacy-free insurance portfolio that delivers an instant, smart and utterly glamorous product. Operating for just a couple of months, it has also broken a record on claim management: a customer solved it in 3 seconds. Blockchain technology to many is regarded not only as useful to insurance, but also as a real driver. Kevin Wang, Ali Safavi, Scott Robinson from Plug and Play Tech Center, (a Silicon Valley startup accelerator based in 22 countries worldwide, focused on vertical programs including an insurance-focused one), claim that the power of this technology lies in its ability to leverage on innovative financial transactions, improve existing insurance processes, and track and trace documents. Blockchain-based digital currencies can support many new insurance models, in particular micro-insurance and P2P. Many of the blockchain applications could be grouped into a new category of smart contracts: in other words, these contracts would be software developed and executed within a blockchain system. Blockchain technology can make insurers leap into a new era, starting with new models of micro insurances, P2P, parametric insurances. This is a key challenge for insurance companies, which can be worth up to $20 billion. Burnmark’s “Insurtech Report 2016” considers cybersecurity to be one of the drivers that will boost insurance and insurtech growth in the coming years. According to the report, in recent years, cyber security insurance has grown a lot in terms of market size and turnover, despite the fact that it was still a sector to be carefully covered by companies, given the actual difficulties in predicting, containing and managing cyber attacks. There is still little historical data required to establish proper pricing of policies and there is a large year-on-year variation in the type of cyber attacks and damage that companies experience more than ever. However, cybercrime annually accounts for about $330 billion to $500 billion for the community, and these costs will increase as the digitalization and digital integration of the entire supply chain of business organizations increase. Against this backdrop, the global market for cyber insurance is expected to reach at least $20 billion in premiums subscribed by 2025. The issue of information security is therefore an open challenge for insurance companies in 2017, which must quickly catch up to meet what will be a massive, growing demand. BurnMark’s Devie Mohan states that companies are starting to leverage data in an increasingly sophisticated way to deliver more tailored products to meet increasingly specific consumer requirements. In addition, sharing economy requires niche products, and only those relevant to user patterns of consumption and behavior will succeed. This evolution has led to one of the most interesting developments of insurtech, namely the possibility to take out policies only and as long as necessary (see for example Trov), to pay car insurance only for miles or hours of real driving (usage based insurance as Metromile). The growth of technology companies focused on the IoT, is going to have a huge impact on banks and insurance companies, since offering more relevant data they can reduce costs, provide the customer as well as the insurer with greater efficiency, and create a consistent experience across all contact points, being the basis of usage based policies, which represent a reliable trend in the automotive industry. Subcategories such as smart home and smart building can also be included in the IoT scope, offering multiple opportunities to the insurance industry. The automotive insurance industry is about to be significantly changed, due to the onset of driverless cars, KPMG forecasts that the automotive insurance market may shrink by 60% by 2040 and Peter Diamandis, co-founder of Singularity University, considers it to be even an understatement of the impact. Any leading car manufacturer has been working on the driverless car, and since these cars are rumored to reduce accidents by up to 90%, it could be the end of the car insurance. Even though there is a pending legislative challenge upstream to reshape the system of automotive insurance under the new setting: will the responsibility lie with car manufacturers, car owners, software engineers? It is still to be ascertained. The UK is likely to be the first country worldwide to govern the sector with an insurer and manufacturer liability regime. Chatsbots are the current trend in artificial intelligence, virtual assistants who interact with users as if in a human context to support them in the process of purchasing, requesting information and providing online assistance. These new tools are being widely used in a variety of sectors and are attracting interest from the public and from companies too, since increasing the quality of service and reducing support costs. However, the role of agents may not necessarily end, as there are also those who think that at least for the moment the market still needs it and that technological innovation must complement and support their work. “Digital literacy is not completed yet – said Diego Pizzocaro, CEO and founder of Sellf, the startup developer of a CRM platform for agents – Furthermore, taking out a policy often requires a confidential and trustworthy relationship, also because of the sensitivity of the shared data, so that many customers still choose the real agent”. Of course, customer experience differs by age and other personal and lifestyle characteristics, as Accenture pointed out, identifying Digital Nomads, Value explorer, Quality seeker, three types of insurance clients nowadays. Artificial intelligence technologies such as chatbots and robo-advisors are probably the most effective tools to reach Millennials and are solutions that insurance companies look forward to with the utmost interest. Spixii, a startup founded by two Italians in London, is a case in point and also won Open-F@b Call4Ideas 2016, the pan-European contest promoted by BNP Paribas Cardif with InsuranceUp and Polihub. The startup is developing a chatbot for the insurance industry, mentioned in this article, and was developed from the analysis of the buying process of the younger generations with respect to an insurance policy.